I had noticed Msgr. Henry A. Kriegel's youtube-culosis video a few days ago and was mustering the energy to provide some insight to the errors listed. Thankfully, the Remnant's Chris Jackson has taken the matter in hand. 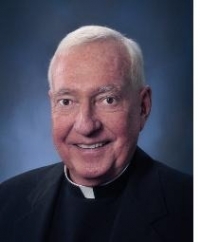 The Remnant recently came across a very telling October 7, 2013 homily by Msgr. Henry A. Kriegel of Saint Patrick Church in Erie, PA. (See below). Since viewing that homily, I've had the misfortune of viewing other talks and homilies from Msgr. Kriegel, proudly posted all over YouTube by Saint Patrick's. During most of these lectures, Msgr. Kriegel presents various erroneous propositions as fact citing no other authority than a vague "consensus of scholars." Nevertheless, the danger here is that unwitting faithful, assisting at Msgr. Kriegel's masses, will accept the authority of their Pastor (who is in "full communion") trusting that he speaks for the Church. In reality nothing can be further from the truth. Msgr. Kriegel is yet another sad example of a priest with a thoroughly modernist conception of the Church. He is allowed free reign over the poor souls in his parish with the apparent tacit consent of his bishop and the Roman authorities. To do my small part in alerting any parishoners of Msgr. Kriegel's that he is preaching his own doctrine and not that of Christ or the Catholic Church I will take a few statements from Msgr. Kriegel and analyze them below. First, notice how the authority for this proposition consists of anonymous "scripture scholars." Are these "scholars" Catholic? Are they dissenters? And, in any case, what authority do they have to speak on behalf of the Church? The clear intimation here is that the "modern scholars" are specialists in the field and are therefore a sort of infallible authority that cannot be contradicted without ridicule and scorn. To hear them talk about their works on the Sacred Books, in which they have been able to discover so much that is defective, one would imagine that before them nobody ever even glanced through the pages of Scripture, whereas the truth is that a whole multitude of Doctors, infinitely superior to them in genius, in erudition, in sanctity, have sifted the Sacred Books in every way, and so far from finding imperfections in them, have thanked God more and more the deeper they have gone into them, for His divine bounty in having vouchsafed to speak thus to men. Unfortunately, these great Doctors did not enjoy the same aids to study that are possessed by the Modernists for their guide and rule, - a philosophy borrowed from the negation of God, and a criterion which consists of themselves. We now declare and expressly enjoin that all without exception are bound by an obligation of conscience to submit to the decisions of the Pontifical Biblical Commission, whether already issued or to be issued hereafter, exactly as to the decrees of the Sacred Congregations which are on matters of doctrine and approved by the Pope; nor can anyone who by word or writing attacks the said decrees avoid the note both of disobedience and of rashness or be therefore without grave fault. Should the verdict of tradition be considered to give adequate support to the statement that Matthew wrote before the other Evangelists and wrote the first Gospel in the native language then used by the Jews of Palestine for whom the work was intended? Answer: In the affirmative to both parts. Can the composition of this original text be postponed till after the time of the destruction of Jerusalem, so that the prophecies it contains about that destruction were written after the event; or should the oft-quoted text of Irenaeus (Ads. Haer. Lib. 3, cap. 1, n. 2), of uncertain and controverted interpretation, be considered to have such weight as to impose the rejection of the opinion more in harmony with tradition according to which the composition of the Gospel was completed even before the arrival of Paul in Rome? Answer: In the negative to both parts. Is it lawful to postpone the date of composition of the Gospels of Mark and Luke till after the destruction of the city of Jerusalem? Or, on the ground that our Lord's prophecy concerning the destruction of that city appears more detailed in Luke, can it be maintained that his Gospel at least was written after the siege had begun? Thus, the new view of Msgr. Kriegel's scripture "scholars" has been condemned for almost a century. But what harm is there in saying Mark was written before Matthew, you may ask. Or that the Gospels were written after the fall of Jerusalem? This goes back to the a priori modernist assumptions. 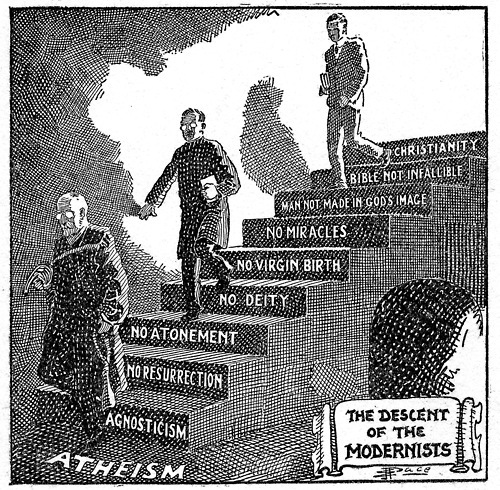 The modernists have a certain set of deeply held erroneous beliefs and the facts of history must be made to conform to those beliefs. For example, it is not curious that the most vehement proponents of the idea that Mark was written before Matthew has always been the Protestants? This is because Matthew 18:18 contains the mostr clear language regarding the establishment of the papacy and its authority. If the Protestants (and modernists) can show that Mark was written first, they can say that Matthew (or the later Christian Church) "added" the section about the papacy, since it was not in Mark's original account. As for the Gospels, dating them after the Fall of Jerusalem calls into question Christ's prophecy about the Fall of Jerusalem, one of the proofs of His divinity. For if the Gospel authors wrote about the Fall of Jerusalem after it already happened and attributed it to Christ, it would appear as if Christ's prophecy could have been manufactured. In addition, as Msgr. Kriegel himself admits, modern "scholars" are pushing the dates of the Gospels further and further from the time Christ actually lived. Why? Because the more time they can put in between Christ's death and the Gospels, the more they can question the crediblity of the Gospels as the authentic words of Jesus, since more time means more chances the later Christian community inserted certain things. Thus, by simply moving the dates of the Gospels forward and flipping the sequence of Mark and Matthew the modernists call the papacy into question, call Christ's divinity into question, and call the veracity of most of the Gospels into question. Pope Leo XIII and St. Pius X knew what they were up to, hence the need for the Biblical Commission. Msgr. Kriegel: The Vatican has said that American Catholics are Supermarket Catholics; we pick and choose. I would prefer to say we’re thinking Catholics. But what they say is that if you don’t want to take the whole carriage full of everything then maybe there is no room for you in the Church. Well they got their wish. 35% of American Catholics now call themselves former Catholics. 50% of German Catholics say the same; 60% of French Catholics and 80% of Dutch Catholics. Where are your children? They’re good people. Did they abandon the Church or did the Church abandon them. Short answer? They abandoned the Church. This is precisely why they rightly refer to themselves as "former Catholics." According to Msgr. Kriegel's implication no "thinking" individual could accept Catholic teaching whole and entire. This is the precise motivation for the entire modernist movement. Their idea was that the Faith was absurd to rationalistic modern man and so we needed to strip the Faith of everything rationalists could object to in order to make it acceptable to "thinking" individuals. Many therefore of his disciples, hearing it, said: This saying is hard, and who can hear it? But Jesus, knowing in himself, that his disciples murmured at this, said to them: Doth this scandalize you? If then you shall see the Son of man ascend up where he was before? It is the spirit that quickeneth: the flesh profiteth nothing. The words that I have spoken to you, are spirit and life. But there are some of you that believe not. For Jesus knew from the beginning, who they were that did not believe, and who he was, that would betray him. And he said: Therefore did I say to you, that no man can come to me, unless it be given him by my Father. After this many of his disciples went back; and walked no more with him. Then Jesus said to the twelve: Will you also go away? And Simon Peter answered him: Lord, to whom shall we go? thou hast the words of eternal life. And we have believed and have known, that thou art the Christ, the Son of God. Would Msgr. Kriegel dare ask Our Lord, "Where are your children? They’re good people. Did they abandon You or did You abandon them?" If he did, rest assured Our Lord would not change the teaching on the Eucharist out of a misguided compassion. Instead He would no doubt ask the Monsignor the same question, "Will you also go away?" Msgr. Kriegel: He [Francis] told those Cardinals, I want you to go back to your regions of the world and talk to the bishops about this question I’ve raised about divorce and remarriage. Do we have the whole thing wrong? Are we punishing people who made a mistake, rather than forgiving them? He said we only punish people who commit a crime. But from the beginning of the creation, God made them male and female. For this cause a man shall leave his father and mother; and shall cleave to his wife. And they two shall be in one flesh. Therefore now they are not two, but one flesh. What therefore God hath joined together, let not man put asunder. And in the house again his disciples asked him concerning the same thing. And he saith to them: Whosoever shall put away his wife and marry another, committeth adultery against her. And if the wife shall put away her husband, and be married to another, she committeth adultery. To them that are married, not I but the Lord commandeth, that the wife depart not from her husband. And if she depart, she remain unmarried, or be reconciled to her husband. And let not the husband put away his wife. Secondly, any divorced and remarried Catholic can, at any time, receive forgiveness for making a mistake by repenting of the sin, going to confession and either leaving the adulterous relationship or agreeing to live as brother and sister if there are children involved. In holding this teaching the Church punishes noone. It instead clearly lays out the means whereby the penitent can be reunited with the Church. Ironically, it is under Msgr. Kriegel's paradigm that good Catholics who did not "make a mistake" would be punished for a crime they did not commit. Good Catholics who are faithful to their marriage vows would then have to witness the unfaithful spouse who abandoned them enjoy Communion every Sunday fully participating at their local parish while all the while holding hands with the adulterer they continue to violate their marriage vows with. Would this truly be "mercy" and "forgiveness"? No. Instead it would result in the Church giving comfort and support to adulterers while committing detestable injustices towards Her own faithful children. The Church is supposed to be on the side of the innocent spouse, cutting off the adulterous spouse from the sacraments (save confession) in hopes that he or she will truly repent and return to the marriage. The Church is supposed to show compassion (suffer along with) the wronged spouse and offer support until such time as the prodigal spouse returns. At that point the Church, of course, will welcome the previously lost spouse with open arms. Until then any change that allows Communion for the divorced and remarried can hardly be called "mercy." Notice how all those in favor of this change only focus exclusively on the "hardship" of the spouse that committed adultery (never once using that word) not being able to receive Communion. But not once do they bring up the true hardship of the faithful spouse who believed the Church when She told them marriage was forever and patiently waits and prays for the wayward spouse to come home. As an antidote to the Msgr. Kriegels and Cardinal Kaspers of this world, I implore anyone currently struggling in a marriage, anyone who has left their spouse for another for an illicit marriage, anyone left by a spouse, and everyone else to listen to the following talk on marriage by the Venerable Archbishop Fulton Sheen. Never have I ever heard a more beautiful explanation of the Church's incredible view of marriage and the true and only path that will ever lead to happiness for troubled marriages or divorced spouses. It is a voice practically non-existent in the Church today and one sorely needed. I promise you that if you take the time to listen to the following conference, you will be infinitely blessed by it. Also please pray without ceasing for the upcoming Synod on the Family, that Christ will watch over His Church and that the Traditional Catholic view of marriage so eloquently stated by Archbishop Sheen wil once again become the norm in our day. What the Halifax is Theology of the Body?